In the village of Agios Andronikos of Yialousa in the Karpas peninsula, there is the cave where Saint Photini the Cypriot, who in Cyprus is known as Saint Fotou, lived an ascetic life and who is one of the most beloved saints of the region. When the residents of the village discovered the cave, they declared Saint Fotou as patron saint of the village and built a church in her honor under Archbishop Chrysanthos (1767-1810), in the 18th century. Every year on the eve of the feast of Saint Fotou, which is on August 2nd, thousands of faithful from across the Karpas but also from other parts of Cyprus filled the village of Agios Andronikos where they made temporary huts and began one of the biggest festivals of the island, with plenty of songs, dances, food and drink. 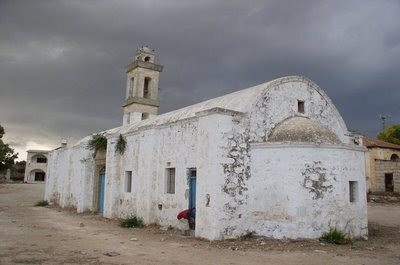 The village of Agios Andronikos was until 1964 a mixed village and thus the Turkish Cypriot residents also participated and celebrated at the festival together with the Greek Cypriots. Despite the love that people from the Karpas have for Saint Fotou, there is no information about her life, her origin, and the time she lived. What is known about her is based on tradition and the historian Leontios Machairas. Local tradition from the Karpas says that Saint Fotou came from the village of Rizokarpaso and was of humble parentage. From a young age she rejected secular life and marriage, and left to live an ascetic life in a cave which she carved out herself. There, Saint Fotou lived a holy life, with prayer, fasting, abstinence, virginity, and a life fully devoted to God. Tradition says also that Saint Fotou performed miracles even when she was alive. When she died, she was buried by faithful and devout Christians. 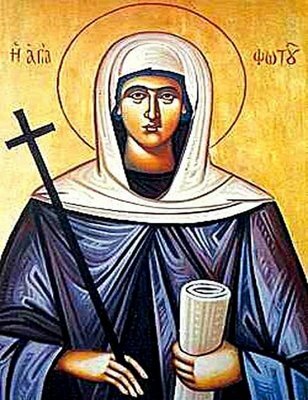 In her tomb which was discovered by divine revelation, the following words were written: "Photini, Virgin Bride of Christ. "By the Karpas peninsula at the village of Agios Andronikos, there was found a little while ago by God's revelation, the tomb of Saint Photini, and her cave is below the earth. It has a Holy Altar and a place of worship and has Holy Water which runs very deep in depth, and with each new moon the top of the water turns into ice and afterwards people lift it off and it starts melting into small particles as thin as dust. The blind take these small particles and rub them on their eyes and the blind get well and can see." Saint Fotou in particular is believed to cure diseases of the eyes. Her tomb is underground and is carved with 23 steps and the holy water is deep in the cave. After becoming refugees, the residents of Agios Andronikos carried the bones of Saint Fotou to the free areas of Cyprus and placed them in the newly built church of the Apostle Andrew at the Kolossi refugee settlement in Limassol. The well with the holy water is said to have dried up since the Turkish settlement of Northern Cyprus in 1974. 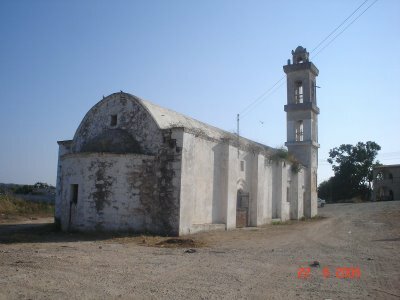 From 1974 until 2003, the Church of Saint Fotou at the village of Agios Andronikos which you can see in the pictures, was used by the Turks as a stable for sheep after first being desecrated and pillaged. Boast of Karya and ornament of Cyprus, and the strength of the sick, recovering those with defective sight, who with faith run to your divine temple, glorious one, always granting healings to your servants, that we may cry out with thanks, Photini Venerable Bride of Christ and comely virgin: Glory to Him Who glorified you, glory to Him Who crowned you, glory to Him Who works through you all manner of healings.